I’ve gotten such great feedback since launching The Skinnytaste Meal Planner and sharing a sample of my weekly dinner plan for the week, this is now going to be a Sunday ritual. I do all my food shopping on Sundays, but you can do what works best for you. Omg love this meal plan ans so did my family super delicious. I can not seem to find week one and week two??? Have they been deleted? Week 1 is combined with the Meal Planner (first one listed in meal Planner link on the site) and I just made sure Week 2 is now there as well. Thanks for noticing! Thank you!!!! Going to give the weekly meal planning a whirl! So thankful for this!! I sometimes dread over planning out my meals for the week and love having something clearly laid out for me to go by, plus it’s always on the healthier side!! How much weekly do your meals usually end up costing, I’m trying to eat heathly but its so expensive! These plans are great but it looks time consuming when I don’t get home sometimes after a workout until 8pm. Any suggestions are appreciated. Just bought your cookbook! Amazing! Do you have a day on the weekend maybe, where you could take some time and make meals for the week? Or prep meals so all you have to do is cook them when you get home? Also making double batches and freezing leftovers into portions may be another option for your schedule. I love love love the cookbook but the #mealplanner is not as functional as I was hoping for. It's desperately missing a section to write a grocery list. Maybe something to add to the next version. This is the first meal plan I have tried from your site, and I thank you. All meals were a success and I again thank you for the thought and care you put into your meals. 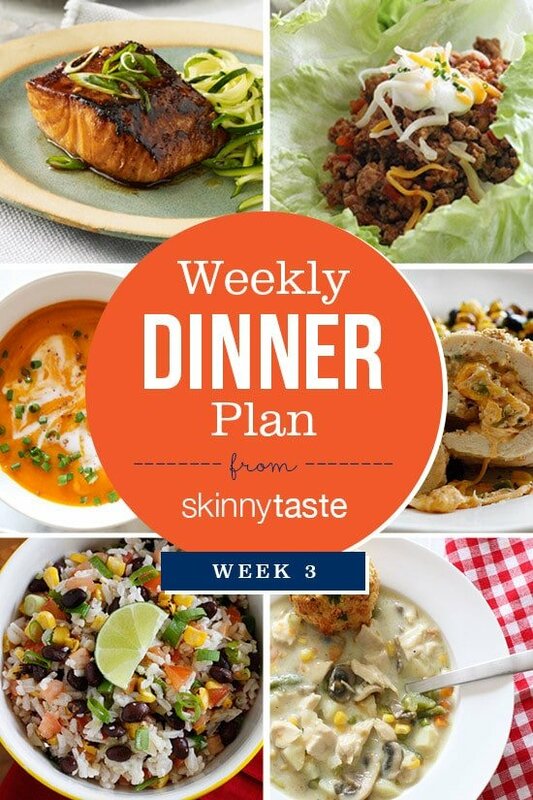 Hi Gina – I just saw your Skinnytaste Dinner Plan – what a GREAT idea! My biggest problem in staying "on plan" is figuring out a menu and plan for the week. This takes all of that work out of it for me and I thank you from the bottom of my heart! I love your site, your cookbook and all of the recipes that you put together. Thanks again! 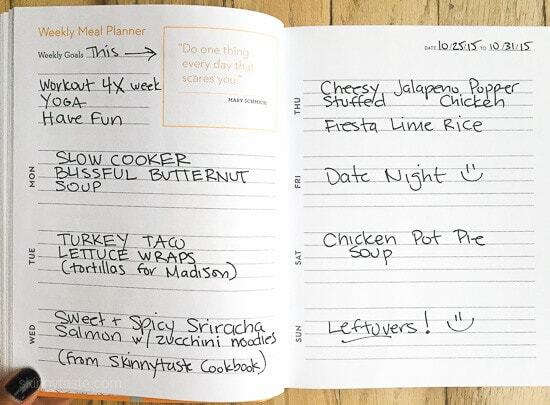 Thank you for posting this weekly meal planner! I love your recipes–I've made the cheesy jalapeño popper stuffed chicken and chicken pot pie soup more times than I can remember–and especially enjoy how they are healthy, flavorful, inexpensive, and easy. Also, your cookbook is fantastic and my mom (who bought her own after I was always sending her your recipes) and I both cook from it all the time. Keep up the good work! We are currently remodeling our kitchen and I cannot wait to start cooking your recipes again! I love this! While my son is napping on Mondays, I am usually browsing skinnytaste for recipe ideas for new things/old favorites that utilize whatever is in season and have somewhat similar ingredient listings to make grocery shopping easier . I love that you do this now! Just as an fyi, I'm trying the slow cooker Picadillo tonight. Yes if you sign up for free emails (top right column) you will get this and new recipes emailed to you. HI..Thank you for your meal plans, it really helps. I was wondering though what you typically do for breakfast and lunch as well. Hello Skinny Taste, I saw this very late and obviously missed weeks one and two! How can I get them so I can start the plan? You will have to scroll for now but I will make it easy this week to find them all in one place. I love it when meal plans include the grocery list. It just makes it so much easier to recreate. How much do you stick to that exact list and how much do you feel you go off track when you are in the grocery store? I feel like I'm always winding up at the store during the week picking something up! I go a few times a week but remember that I am testing new recipes each week. Absolute brilliance these Dinner Plan Weeks…This format is SO very de-stressing for those whose constant question involves the 'What to make for dinner tonight'!' conundrum. If I had but ONE request…it would be that you would write a BOOK for meal plans involving 365 days…a year's worth of go-to Gina-inspired dinners…I would stand in line in the snow to obtain such a goldmine of gina-yus (genius!) ideas. Then…with the forecasted MAJOR success of such a venture…you could imagine follow-up books for breakfasts and then…third 'tome'…lunches??!! I can dream can't I?! The dinner soups you have provided thus far are my favorites…and love that you match the ingredients/dishes with the season. Heartfelt thanks to you and your generous sharing of your wealth of culinary expertise! Thanks so much for sharing this, Gina! This is just awesome. I love all of your recipes. I am always recommending your site to anyone who wants to combine healthy and delicious. Now what's for breakfast and lunch? I need a whole meal plan. Better still would you come and cook it for me? I'll do the dishes! Ha! I don't usually plan my breakfast, and lunch is usually leftovers! I have been trying to come up with a week's worth of menu to buy accordingly and consume wisely. I haven't done your specific week menu in its entirety, but am considering for future weeks (especially like the shopping list — it would be useful if that list can be printed (from PDF or doc.). I am wondering on those days that you have soups, do you serve anything else with it? I wish I knew how to do that, I will look into this! If the soup is hearty, usually not. Sometimes some bread, salad. Depends on the soup. I usually plan meals for the week. That way I know what I need when I go food shopping. I'm enjoying seeing your meal plans – you've already reminded me of a couple of recipes I want to try. My family and I absolutely love, LOVE just about every single one of the recipes we've tried! I have an entire Pinterest board dedicated to Skinnytaste:) ~ Love your blog and the great way all the recipes (and grocery lists!) are organized! You are a huge help to my busy family in keeping us eating deliciously healthy! Thank you! Thank you SO much, this means the world to me! I love this. But I miss when your blog was hooked up to zip list. I think they went out of buisness and the company that took over I could never figure out how to work it. Anyway It was so easy to make a shopping list that was put into sections like you would have at the store. Then my list were saved too and I could just rotate which ones I wanted each week. I usually make all skinnytaste meals so Zip list was really really awesome. I know, I was so bummed when this happened and haven't been able to find a replacement. Still looking! I like Pepperplate. You can import the Skinnytaste recipes by copying and pasting the url link and it will create the shopping list easily. You are so thoughtful always in your blog, especially in these posts with including a grocery list. I love your blog, I've been using it for months now. Had your enchilada soup tonight, delicious! Thanks so much!! I used your meal plan and shopping list last week, THANK YOU! Not only did I not have to think about what to make for dinner, I had left overs for my husbands lunch. Everything was delicious and I'm printing out my plan for this week! Wonderful!! THIS makes me SO happy Robin! I love this! I these a great options, a nice mix!